Israel is the geographic landbridge joining three continents - Europe, Asia and Africa. 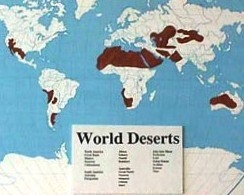 This unique location greatly contributes to the ecology of the region for it is via this landbridge that flora and fauna can easily spread from continent to continent and intermingle thus creating rare and special ecosystems. Further to the physical bridge a large portion of the world's migratory birds (dozens of species and over half a billion birds) pass over this region on journies that span the globe. If Israel is the 'landbridge' then the Negev is it's center. The ecology of the Negev is greatly effected by it's location and the fauna and especially the flora reflect this. Israel's deserts are the northern most part of the Saharah Desert Belt that stretches from the Sahara in central and northern Africa through the Sinai Desert in Egypt joining with the Negev and the Judean Deserts in Israel. The Negev is for the most part a rain shadow desert shadowed from the prevailing winds, and rains, by the Mediterranean coastal plains and the hills that rise from them towards the Negev Highlands. The boundaries of the Negev are not exact, nor entirely agreed upon, but it is common to regard an area recieving less than an average of 200-250 mm of rainfall per annum as a desert and more specifically the Negev's boundary in the north is defined by this rainfall boundary. In the east the Negev is bound by the Arava Desert and Israel/Jordan border while in the south and west the Sinai Desert and the Israel/Egypt border define it's borders. Sticking to this simple rainfall definition of a desert the Negev in fact covers roughly 65% of Israel's territory but astoudingly boasts only 15% of the country's population thus making the rest of Israel one of the world's most densely populated countries. It is these statistics that make the Negev a wilderness region in more ways than one, and together with the aforementioned ecology, help make it a nature lovers dream. As if all this were not enough the topography of the area too comes into play creating many different climatic zones and/or microclimates. In a relatively small geographical region there are areas with extreme desert conditions and others that are much "wetter" and in the winter months the higher desert areas even get the occassional snow fall. The archaeological sites that litter the desert bear evidence to the region's rich and varied history - stone, copper, bronze and iron ages or; early Israelite, Nabatean, Byzantine, Roman, Arab, Bedouin, Turkish, British and of course the Jewish settlement pre and post independence.